The famous Paula Wolfert, the madame of Moroccan cuisine, stated in her book "The Food of Morocco" that the seductions of Moroccan cuisine "did not creep up on me slowly, but hit me square in the face almost at once. The sharp scent of cumin in the air. Passing by a community oven and catching the scent of anise and freshly baked bread. The street smells of grilling skewered meats. Whiffs of pungently spiced fried fresh sardines. The unique aroma of chickpea flour being slowly baked with olive oil and eggs to make a glistening flan in a wood fired oven." It is almost a religious experience for Paula and Caroline Hofberg, the author of "Morocco on a Plate" seems to have had a similar experience during her time in Morocco "you can practically taste the mysticism of Arabian culture through the food of Morocco" states Caroline as she describes being swept away by the piquant smells of an exotic world. She goes on to contrast the spices of Morocco which are arranged "beautifully like art" with those in her home country of Sweden where the spices are "packed tightly into sterile, fragrance blocking glass or plastic containers". Something all western cooks can relate to and lament. I have explored a little of Moroccan cooking through books such as those from Paula Wolfert, among others, and I wasn't sure what else "Morocco on a Plate" could bring to the table, pardon the pun. Once I started cooking from the book it dawned on me there was quite a but I had been missing from the Moroccan dishes I had chosen to cook in the past. Caroline has a real focus on the nuts and dried fruits used in Moroccan cooking. The combination of sweet fruit with savoury dishes seems odd at first but that is only until eaten. Turns out the combination works harmoniously, with the nuts offsetting the sweetness of the fruit and in turn lifting the meats to another dimension. I paired Caroline's Chicken Stew with fruits and almonds with couscous with roasted vegetables. Both dishes heavy with fruits and nuts I was worried it would be a cacophony of flavours. It turned out to be two fabulous dishes that when presented on large platters and in deep bowls with a side of the minted yoghurt dip suggested for the couscous was the perfect dinner party meal. 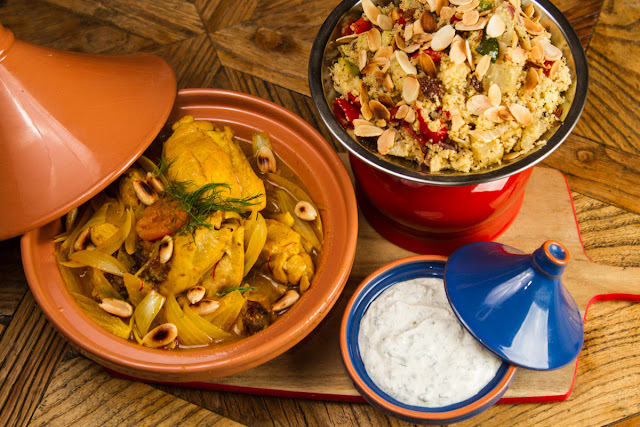 Hearty, homely and colourful it was a meal that truly represented Morocco on a plate. I think the stews are the strong point of the book. These one-pot dishes are easily re-created at home and if done so in a tagine or claypot evokes the rustic nature of Moroccan cooking. The skewered meats whilst can be cooked in the oven or on a gas barbeque will pay you back ten fold if you cook them over some charcoal as would be done in Morocco. The smokiness transforms meats adding a depth of flavour that cannot be achieved any other way. This isn't a technique suggest by Caroline in the book and rarely ever is in cookbooks for fear of putting off the home cook who wants easy and familiar cooking methods but trust me, if you have not cooked over coals it is time to start. I have a little hibatchi that is relatively unintimidating and perfect for a small batch of skewered meats. As a cookbook collector this book is an appreciated perspective on a broad cuisine. It isn't the only Moroccan cookbook you will ever need but it is an enjoyable read and more importantly, an easy cook and a good eat. A review copy of this book was supplied by Skyhorse publishing. It is now a treasured part of my cookbook collection and I would highly recommend it for yours as well. Grab your copy here. Just received my copy from Booktopia, what a beautiful book. Looking forward to tasting the delicious recipes.